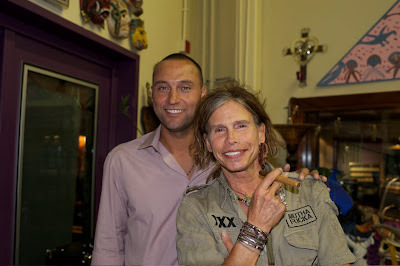 Aerosmith had a surprise visitor to their studio last Friday night: New York Yankee shortstop Derek Jeter (pictured above with Steven Tyler). Considering Boston is Red Sox central, this could have been a tense situation, but all was cool, reports the gang at Aerosmith fan club AeroForceOne. Turns out Jeter is a good friend of producer Jack Douglas. Small world, but Derek became pals with Jack when he was producing Aerosmith’s 1982 album, “Rock In A Hard Place.” With Brad Whitford out of the fold, the band hired guitarist Rick Dufay to try to take over Brad’s duties. Rick and Jeter have a close personal tie, and Jack and Rick became lifelong friends. There were only a handful of people in the studio that night but the Yankee spent about a hour and half chatting and listening to some of the bands new tracks with Douglas and Tyler; Steven and Brad were the only band members in attendance. Jeter was certainly in enemy territory but he felt right at home with Jack and Steven being native New Yorkers. Aerosmith are currently in the studio working on the group’s first album of new material since 2001's "Just Push Play."